11/28: Comfortable Living Room with Leather Sofas, Fireplace & 55 inch HDTV. 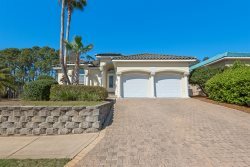 3 Bedrooms, 3 baths included in this elegant 1,500 sqft Destin Vacation home, with wrap around front porch and screened in rear patio. This home features granite countertops, top of the line stainless steel appliances, 46” HDTV, elegant but casual comfortable throughout, giving you the true feeling of quality but in a family friendly environment. This well laid out home is perfect for multi-generation family gatherings following a day at the beach. Close to the beach. Oversized pool in large backyard with fountain with integrated lounge platform. This spacious three-bedroom vacation getaway has the all of the conveniences of home at a great price.. Spend the day relaxing on the beach, or lounging around your oversized private pool. This home is in the heart of Crystal Beach close to great shopping, entertainment and restaurants. Book this house today and you’ll start your first year of a family tradition. We spent all of February at the Cottage by the Sea and our son, daughter-in-law and grandson joined us for a week. It is a great location and close to everything. There are several close beach accesses with parking and one with public restrooms. The Cottage was clean and had everything we needed (except a pizza cutter - ha-ha). We particularly enjoyed the front porch. While it was too cool to swim, the pool deck was a very comfortable place to enjoy the warm Florida sunshine. The managers were extremely easy to work with, both in scheduling and in responding to our needs while we were there. We had a minor maintenance issue that we advised the managers about by email on a Friday evening. The manager's son was there first thing Saturday morning to take care of the issue! We were very impressed with the prompt service. Great team and very informative.